Sev is branded with the mark of a criminal—a star burned into her hand. That’s the penalty for being the daughter of the woman who betrayed their entire nation. Now her mother’s body is displayed above Traitor’s Arch, kept in a paralyzed half sleep by the same plague that destroyed the rest of the world. And as further punishment, Sev is forced to do hard labor to prove that she’s more valuable alive than dead. When the government blames Sev for a horrific bombing, she must escape the city or face the chopping block. Unimaginable dangers lurk outside the city walls, and Sev’s only hope of survival lies with the most unlikely person—Howl, the chairman’s son. Though he promises to lead her to safety, Howl has secrets, and Sev can’t help but wonder if he knows more about her past—and her mother’s crimes—than he lets on. But in a hostile world, trust is a luxury. Even when Sev’s life and the lives of everyone she loves may hang in the balance. 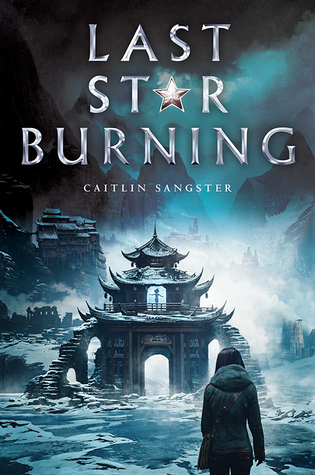 Last Star Burning is kind of like that book I didn’t know I was looking for. The story reminds me of many different dystopia smashed together to make it’s own thing. I really enjoyed the story and the way the book takes you on a topsy turvy ride through the whole thing. So when the book first started I was a little confused by the star rankings and things that happened but it quickly found it’s footing and I got a grasp of the world. It was interesting to learn the reasoning that the city is created and why it stays that way. There are times when you are like what, because you never really know what is true and what isn’t. I felt like I was navigating the story hand in hand with Sevvy. I wasn’t like oh I know what’s going to happen because I was too focused on what was occurring that moment. Which made me really like it. After I finished reading I kind of sat and pondered the whole picture, fitting all the pieces you found along the way together. I loved Sevvy. She is smart but also cautious. She’s also very very angry. She had so many things taken away from her. Is constantly treated like dirt. So I love when she’s presented with something else and told everything she believes is a lie. She has the, are you serious, do you think I’m going to just believe you. In that sense she is strong. It also makes her more aware and she goes off people’s actions. She chooses to believe someone based on what she has seen of the person herself. I liked this about her but that doesn’t mean she can’t get burned. While I was reading I just really wanted to Sevvy to find her own piece of happiness. My second favorite character is June. She someone that is so fierce that we don’t know enough about. So there is also Tai-ge and Howl. Tai-ge has been Sevvy’s friend since she was 8 years old. Even though he shouldn’t be because of their class status. He is very sweet and kind to her. I love their friendship. Then there is Howl who is kind to Sevvy but always seem to be hiding more than he is letting on. They fall into an easy relationship as they spend time together. She let’s her guard down with him. I really enjoyed the book. I felt like it was fast paced and you never really knew what was around the corner. Which also leaves me to not try to spoil anything. The ending is kind of one of those weird cliffhanger/not cliffhangers. I do need the next book as soon as possible though. I want to know where things go from here. I am very happy to see this type article. it is very useful and exciting. the best blessings of this article is giving properly idea to each and every readers and also it's giving correct impressions. Looking forward to new article. Check custom essay writing service for getting genuine writing guidelines.